Writer Louis L'Amour sits at a desk. “According to Choctaw lore, Louis L’Amour lived here for a time. Can you tell me where he lived?” emailed KGOU listener Jo, who lives in Choctaw. Louis L’Amour was a prolific Western author. He wrote several hundred novels and short stories starting in the 1940s, such as “The Shadow Riders" and “To The Far Blue Mountains,” and some were adapted into movies. “No one even comes close, writing about the West, to the popularity of Louis L’Amour,” said Richard Etulain, a retired history professor specializing in the history and literature of the American West. L’Amour’s stories follow a typical pattern, according to Etulain. They usually feature three main character types--a hero, a villain and a heroine--and each chapter usually ends on a cliffhanger. “Within the first two or three chapters, Louis L'Amour will have already clear in your mind which ones are the rascals and which ones are going to be the heroes,” said Etulain. Etulain says L’Amour’s stories are full of adventure, but he focused more on action than on character development. “They’re not cerebral books. We read them not so much for the ideas as for the actions that occur,” Etulain explained. 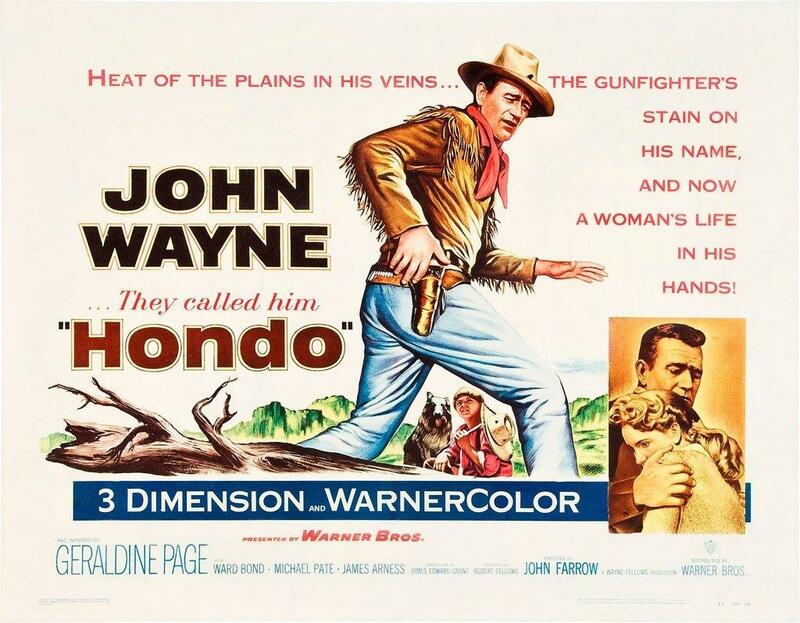 Movie poster for "Hondo" (1953), starring John Wayne and based on a Louis L'Amour novel. L’Amour was born in North Dakota in 1908. Financial troubles forced his family to move throughout the western United States starting in the mid 1920s. As an adult, L’Amour traveled widely and held a variety of jobs, from baling hay in New Mexico to working in the mines of Arizona, California and Nevada. He worked on a merchant ship that sailed to England, Japan, China, Egypt and Panama, among other places. And L’Amour had a sporadic career as a professional boxer. “Traveling around the country and working in various remote locations gave [L’Amour] an intimate first-hand knowledge of the territory and landscape where the majority if his stories would be set,” wrote Beau L’Amour, Louis’ son, on the Louis L’Amour website. L’Amour also spent time hiking or traveling through future settings for books, including the Colorado’s San Juan Mountains for "Sackett," Wyoming’s South Pass area for "Bendigo Shafter" and the Utah Canyon Lands for "Shalako." “He bragged, and so did a lot of his readers, that you could go to a very specific place in his novels and see where he had pointed out exactly what the place was like,” said Etulain. Did The Author Live In Oklahoma? According to Beau L’Amour, Louis’ brother, Parker L’Amour, bought a property called Wymena Farm on Rural Route Two in Choctaw. The author and his parents lived there from 1931 to 1942, and L’Amour wrote a series of adventure short stories called “Yondering,” which was not published until 1980. Oklahoma County Assessor Larry Stein could not find proof in county records that anyone named L’Amour owned property near Choctaw. “We went back to the 1800s trying to find out,” Stein said. Louis L’Amour’s Census record from 1940 lists his home as “Cass, Oklahoma,” a township in Oklahoma County, but does not list an exact address. “I guess we can just say...for the entire 720 square miles of Oklahoma County...Louis L’Amour lived here,” said Stein. How Curious is a production of KGOU Radio. It’s produced by Claire Donnelly and this episode was edited by Caroline Halter. David Graey composed the theme music. Special thanks this week to Sheldon Beach and Chad Denson.